Firm compression levels and stay-put performance make these Truform Women's Thigh High Support Socks some of the hardest working compression garments around. Manufactured by Truform, these Women's Compression Stockings administer 30-40 mmHg of compression to treat moderate to severe symptoms of low circulation and venous disorders. 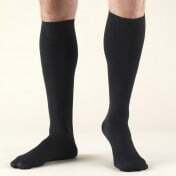 This compression range can relieve symptoms caused by varicosities, post-thrombotic syndrome and chronic venous insufficiency, symptoms such as edema, painful, achy legs and skin changes. Veins and vein valves in the legs can weaken over time, often due to spending long periods of time sitting or standing. As more blood settles in the legs, pain and swelling increase. Similar symptoms can also result from vein procedures or tissue trauma. Compression Therapy provides relief from these symptoms and improves circulation by helping the muscles and blood vessels in the legs return blood back to the heart. 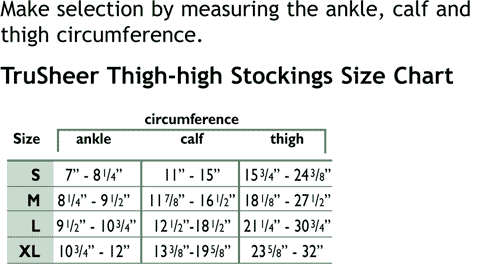 While your legs are getting the soothing relief they need, you'll also benefit from the superb comfort that these Women's Thigh High 30-40 mmHg Stockings offer. Their material blend of nylon and spandex feels great on the skin, and the material elasticity ensures a correct, long-lasting fit. This particular style includes silicone top bands at the tops of the stockings. The bands are dotted with silicone on the inside to comfortably hold the stockings in place, and they even include an attractive lace design. Choose from black, beige, and taupe color options to find the pair that's right for you.